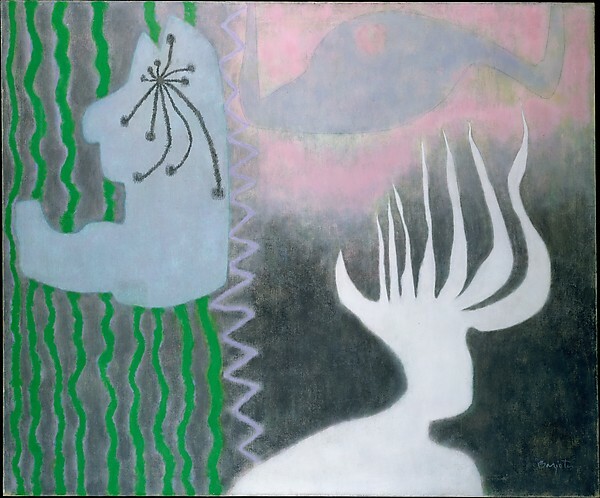 William Baziotes, 'The Flesh Eaters' 1952, Oil and charcoal on canvas / Image Courtesy: The Met Museum. The murder of 16-year-old Junaid was out of sheer spite against a boy whom the criminals realised was not of their religious moorings. Isn’t North India used to Eid celebrations and the muezzin's call at a mosque? Is Islam new to the people there? The answer is obviously “no”. But the question is, why are such feelings whipped up day after day? Why are similar happenings taking place in Uttar Pradesh, a bastion of conglomerate cultures? If these acts are committed by politicians, then it is necessary to examine how and to what extent politics and life are interwoven in India. It is a mad rush of hatred on some pretext or the other against a community. That is why such brazen killings are committed. The perpetrators know that there is support from somewhere; and if this support comes from those who rule the country and their henchmen, there will of course be a free for all. This free for all – a rampant display of right, might and hateful viciousness – is the order of the day, even when the people of the country are pleading for protection of diversity. The “Not In My Name” protest, held spontaneously in various parts of the country on 28 June 2017, is not an argument of rhetoric. It is a plea for sanity in a land whose people are becoming insane and who are stripped of logic. The difference is in the "other". This frenetic search for the "other" (having highly political implications) is also a hallmark of a nation in regress and wallowing in darkness and bnighted upholstery. What has gone wrong? Was it always there, and now since political dispensations have changed there is a tacit understanding between people and power that this can, should and will happen. Or is it inversion of history? We are no longer the infidels, they are, they called us so once upon a time. So the interplay of us and them, the "other" has been entangled in a furious web of malice. But then, should this lead to killings? Yes, when it is mob lynching. But mobs constitute each individual, and such individuals find time to gather and connect; which shows that their feelings of hatred for someone is at sync, with one another in an auto-didact's way.This is really dangerous, the instinctive presupposition that we hate "them" and must lynch. "Not In My Name" protest is to be seen as a build up of an argument for anonymity in terms of caste, religion or race. If the teeming millions of India do not have a name in terms of such references then the India of a monolith will give way to that of quintessence. It is also interesting to see how there are other strange, if not bizarre, happenings which show the class/ caste upper hand eating into societal systems in the most obnoxious of ways. The recent episode in a Delhi club, asking a woman to leave because her dress (the jainsem) was not in decorum, smacks of abysmal ignorance of the culture of others (a term now used in profusion, in present day contexts), and imposing a monolithic culture in the country. Again using the word ''servant'' and then likening it to ''Nepalis'' is the worst and profane kind of negativism, and flaunting self righteousness of the upper classes and their misplaced prudery. Are all Nepalis servants? Can servants not enter your hallowed precincts! Caste, class and religious obnoxiousness are working devilish ways into Indian society as never before. The animosity towards the lower working class, the "un" religious and dalits, are sure signs of a regressive atavistic society. “Not In My Name” will or should obliterate all these, because the name tag is doing or undoing all rights. The name tag is a dismal admission of votaries of misplaced power and bellicosity. I am citing these two disparate incidents to show that indeed, there is a method in (their) madness. The diversity of the country, finery of manifold languages, religion, literature and architecture, the best of tribal traditions, are not accounted for. No, certainly not in my blessed name, nor in THOSE names also. My point is the ruthless chicanery, the troubled practices, the prevarication of Indian history and religion, intolerance of "lower castes" and dalits, the obtrusive similes (or metaphors) between religion and myth, the falsification of history that are taking place today, wrapped in the garb of secularism. The hatred for the "other" (not me!) is poured with vitriol. Above all, the voiceless does not have a place in this spectrum of darkness. Only noises in the shape of pro poor policies exist. What happened to the rich with their tainted money? How much "black" money was retrieved? The poor are getting poorer, the "black" blacker! It is the new rich and the plutocrats playing these inauspicious games and flaunting love for a New India. Ananya S. Guha is a writer based in Shillong. He works at the Indira Gandhi National Open University as a senior academic.